The present paper is a by-product of the author’s unpublished paper on the astronomy of ancient China. In that, particular emphasis was devoted to the problem of an exact absolute chronology based mainly on original eclipse records. Here his approach is similar, with the central issue of new data for the ancient values of Delta-T and their application. A table of 91 solar eclipse records of the ancient world from three continents, from the period between 2353 BCE and 1514 CE, facilitates an overview by using such improved values. Also, the paper deals briefly with the astronomical canon of Emperor Yao and its plausible explanation, suggesting the date 2347 BC (-2346) for the original observations. Furthermore, his present paper adds a personal observation of a strange celestial phenomenon that he calls “horizontal belts of northern lights” which so far seems unknown for the international readership. The author is a Canadian citizen, born in Budapest (Hungary) in 1949. His original profession is geologist and land surveyor, with diplomas. Müller (1879: 27-8 and 33-4) deals with Emperor Yao and his instructions to his astronomers, in the Shu King or Shujing, regarding the culmination of four cardinal stars. Allegedly, certain stars were culminating at the time of sunset, at 6 p.m., at the beginning of each of the four seasons; i.e., the equinoxes and solstices, as follow. ... the star (or stellar division) Shun Hwo (corresponding, it is said, to α Hydrae) culminating at the vernal equinox in Shantung; the star Hwo [α Serpentis and Antares, both in Scorpio] culminating at the summer solstice, Mao [the Pleiades] at the winter solstice, and the star Hsü [the stars of Aquarius] culminating at the autumnal equinox. “This exactly corresponds with that state of the heavens which Yâo, (alleged in the Chinese records to have flourished about B.C. 2300) ... It is scarcely possible that all these indications of the positions of the stars at these several times of the year could be simultaneously correct at any other epoch than somewhere about B.C. 2300 or a very small number of centuries before or after.” Other scholars mention the “acronychal rising” of certain stars or constellations here. The Canon of Yao explained to the heads of two families of astronomers (Hsi and Ho) how to learn the exact starting days of each season. Yao chose four particular stars that would be culminating on the local meridian at midnight at the beginning of each season, or a certain number of days earlier. The four stars of Yao correspond to Fang, Hiü (or Xu), Mao, and Xing (or Sing). 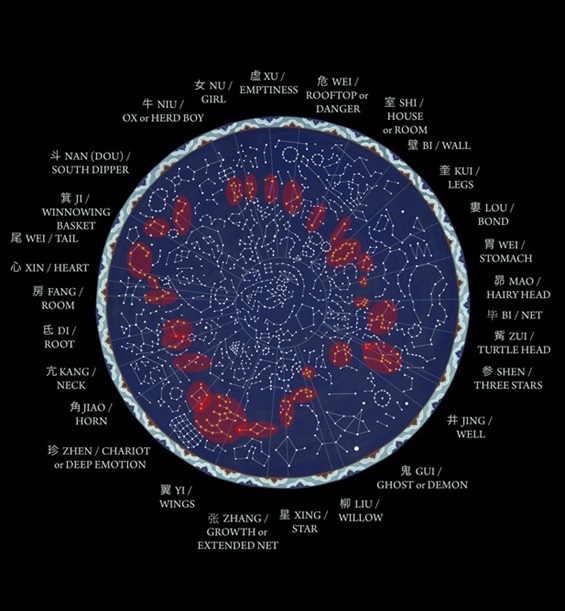 Shea (2007) and Whitfield (2011) illustrate well the Chinese constellations as follow. 虛 (Xū) Emptiness in Black Tortoise of the North (winter solstice). According to Williams (1871: x-xiii), the observations of Emperor Yao took place in 2306 BC, because the Pleiades in 1870 were located at 58 degrees from the direction of the vernal equinox. Allowing 1 degree of arc per 72 years for the precession of the equinoxes, and multiplying 72 by 58, we would get 4176, the number of years passed from Yao till 1870 CE. Using 50.27 seconds of arc per year for the rate of precession, we would get 2285 BC for one of the regnal years of Yao. Playfair (1784: 80) cites Mailla’s chronology, telling that the star Lucida pleidum was in the first degree of Aries in the second year of Yao’s rule that yielded him the date 2280 BC. Shinjo Shinzo also subscribed to the opinion that these observations were made about 2300 BC…” (Ho, 2000: 116). The sizes of the pairings of the xius [lunar mansions] best match the equator of ~24th century B.C. according to the calculations of Saussure (1930) … As conjunction markers, the system would have worked best about 2400 B.C.” (Kelley and Milone, 2005: 316-20). Legge (2000: 19) refers to the calculations of Dr. Medhurst regarding the shift of the equinoxes, concluding that Yao’s reign ended circa 2254 BC. It is widely accepted that the four cardinal stars in question were π Scorpii, β Aquarii (Sadalsuud), η Tauri (Alcyone), and α Hydrae. These stars would culminate after sunset or before sunrise. However, I was uncertain about the visibility of those stars when the Sun was just a few degrees below the horizon. After decades of uncertainty about the issue – that did not even have a name for me – the paper of Schoch (1924) made me extremely glad. The missing name was “arcus visionis” of the stars. But those magic words did not help me to understand Emperor Yao’s rules for several months. It seemed unclear in which hour the observations were made, and whether they referred to heliacal risings or something else. Legge notes that the clepsydra would be ice-bound in the north, and Yao’s astronomers would have been unable to measure time very exactly without any other clock. The old Hungarian word “delej” – meaning magnet as that of a magnetic needle or compass) – is compounded from the words “south-north.” (“Dél” means “south” and “noon,” while the words “éj-szak” or “észak” mean “night-section.”) Such mirror translation is a remnant of the early Chinese influence in that language. It seems plausible that the ancient Chinese were able to use such compass accurately, in order to establish the direction of the culminating star on the meridian. Of course, it is possible that the Chinese did not utilize compass but carefully observed and fixed the southern direction by the Sun’s culmination at noon. In the Neolithic period, some experts may have been able to produce a fine instrument of wood or bone, acting like a rough theodolite. As for the accurate measurement of time, an hourglass-like instrument may have existed, made of fine clay, jade, crystal, wood, bone, or shell, having two conical parts joined by a narrow neck. Two thin, transparent lids at the ends may have allowed the observer to see the clearing of the last grains of sand when the “hourglass” had to be turned over. Thus, Emperor Yao may have been able to establish the exact days of equinoxes and solstices. Emperor Yao [a.k.a. Fang-heun] delivered his astronomical instructions in the first year of his rule (Legge, 2000: 18-21). Yao commissioned the Hsi and Ho brothers to “deliver respectfully the seasons to the people.” Such “delivery” needed time for an agricultural population of a large country. The astronomers could not have announced the approach of spring on the day of spring equinox. Such information would have reached the peasants too late. However, if they announced the approach of spring on January 9, telling them that the daylight hours began to increase, the peasants would have got enough notice to prepare themselves for the works in due time. The spring planting of many products begins in February. Tradition holds (Wikipedia) that Yao became a ruler at age 20 and died at 119. Since Yao ruled for approximately 70+28 years, he must have been a child or teenager in 2304 BC, at his accession to the throne. If he published his astronomical Canon in that year, he had probably received such knowledge from his father or grandfather. Legge (2000: [89-92]) wrote, “If it were possible to fix the exact century, in which it was first observed that the stars of the equinoxes and solstices were neaou and heu, ho and maou, that century may have been anterior to Yaou, and not the one in which he lived… Yaou had reason to expect the stars he mentioned to be in the equinoctial and solstitial colures. But what his reason was we are left to conjecture. It might be personal observation; or it might be tradition from his great-grandfather…” We may accept Legge’s logic and suppose that Yao received this knowledge from his grandfather who made the actual observations – the culmination of the four stars in an exact southerly direction on the local meridian – in c. 2350 BC. It was necessary to establish the limits of Yao’s empire, in order to get the four cardinal cities (northern, eastern, southern and western) where the astronomer brothers or clans lived. The Shoo King describes the inspection tour of Emperor Shun. At the western end of his journey, Western mountain [T’ae-hwa] or Mount Hwa [Hwa-San] is mentioned, ten le south of the city of Hwa-yin. Near the eastern end of Shun’s journey was located the city of T’ae-gan in the Shantung Province, five le to the south of the “honourable” mount T’ae-tsung, the modern T’ae-San. These locations are accurately shown in the modern atlas of Tan (1980: 5-8). The nearest modern town to Mount Hwa is located at 34-33-48 N and 110-05-00 E. The nearest modern town to Mount T’ae-tsung is located at 36-11-12 N and 117-07-08 E.
However, we have an exact location for an early Chinese astronomical observatory at Taosi, mentioned by Nu and Jiabi (2005). Pankenier, Liu and De Meis in the Archaeologia Baltica 10 give its location as 35°52´55.9" N and 111°29´54" E. We may suppose that this site served for the observation of summer solstice in the West, in order to determine the beginning of autumn. In the East, the author first supposed a location at 36-15 N and 119-58 E (at Jiaozhou or Jiaoxian, near Qingdao or Tsingtao). Jiaoxian belonged to the Shandong Longshan Culture in the Late Neolithic Period (ca. 2500 - 2000 BC). It is difficult and quite frustrating to calculate the ideal date for the culminations on the meridian for different locations: Linyi (near the Fenghuangling site), T’ae-gan near Mount T’ae-Tsung, or the city of Weifang do not seem to yield any meaningful year. On the other hand, if the observation of the Alphard took place in Yantai, the matching year would be 2337 BC. If it took place in Laiyang, the date would be 9 January 2355 BC. In later star maps, “typical errors in star placement are about 3° (Stephenson, 1994: 539-540) in Kelley and Milone (2005: 323). In our case, an error of five or ten minutes is minor and could be explained by the errors and uncertainties of the Delta-T in the days of Yao. However, the direction of the error or discrepancy here is the opposite of the discrepancy in the Assyrian observation about a star’s culmination. (See under the Delta-T question below.) Therefore, we have no reason to modify radically our proposed final locations or the suggested decade shortly after 2350 BC. There is a debated solar eclipse record from the days of Emperor Yu, claiming that the Sun came out in the night during his battle against the Sanmiao or Three Miao tribes. Mo-tzu (Motze or Mozi), a Chinese philosopher allegedly wrote at the end of the fifth century BC, “The sun rose at night” in Yu’s reign. Tsai (2003) cited Motze as “the sun came out at night.” The present author has found in Lee (2009: 95) that the philosopher originally wrote, “the sun phantoms appeared at night,” not the sun itself. The Sun never comes out in the night to make an eclipse. The spirits of light may refer to the northern lights (Aurora Borealis) that were unusually seen in northern China. For some excellent photographs please refer to the Internet web site named http://en.wikipedia.org/wiki/Aurora_(astronomy). Its article adds, “The Cree [Indians] call this phenomenon the “Dance of the Spirits” (see the Wikipedia). The present author has seen the northern lights in the city of Red Deer (Alberta, Canada) three times between 2010 and November 2011. Therefore, he is familiar with the appearance of that phenomenon. In 1982 he observed red (pinkish or purple) northern lights on the sky to the north of Seattle. Apart from his three sightings of the northern lights, once he has also seen a new and very different celestial phenomenon as follows. On a night, on 4 April 2011 if my memory is correct, near the eastern city limits of Red Deer, horizontal waves of northern light appeared on the entire sky. They were totally different from the regular northern lights. (We may call them “northern belts” too.) Between 22:00 and 23:00 in local time, the author observed this fantastic phenomenon. It was seen on the clear sky and must have been visible for many persons in town. Shiny, brilliant stripes like belts were moving at regular intervals and distances on the night sky, coming from north. (They seemed like waves that arrive at the seashore, parallel to the coastline.) Of course, the colour of the belts was silvery like starlight. The central zone of each belt seemed more brilliant, or having higher density and total uniformity. In this sense, their steadiness was not comparable to the capricious forms and always changing shapes of the common northern lights. The “waves” run in an east-west direction like parallel lines. They rose above the northern horizon, and followed each other with a frequency of about four seconds or so. Thus, a wave of shiny belt passed over my head once in every four seconds. Each seemed like a very narrow and sharp but straight “Milky Way” and the width of each belt was uniform, each with a constant width. The sight was so majestic and amazing that there is hardly any word to describe them. It was a feeling like traveling by a spacecraft, and crossing new galaxies at regular intervals. It seemed like touching the pulse of the universe, a vibrating and pulsating feeling through immense power. It gave the impression that the universe was alive. Unfortunately, I did not have a camera on me and cannot provide photographs. Due to the rapid movement of the belts, a photograph may have shown a blurry image anyway. Tang was the founder of the Shang Dynasty. Mencius said, “From Yao and Shun down to T’ang were 500 years and more” (Legge, 2000:  and ). Placing the 28 years of associated reign of Yao with Shun between 2238 and 2210 BC, we would get 1738 or 1710 BC for the possible earliest regnal year of Tang, or, rather his victory over the Xia. Liu Hsin (46 BC – 23 CE) placed the conquest of the Hsia Dynasty, in the sixteenth regnal year of Tang, in 1751 BC (Chang, 1980: 16-18). Legge (2000: ) stated that Tang’s first year coincided with Kwei’s 15th year. Chang (1980: 348) refers to Ku pen Chu chi nien, as follows: “[The Hsia dynasty], from Yü to Chieh has seventeen kings … and lasted 471 years,” including forty years of usurpation. Master Mo wrote about Emperor Yu, “Then the three Miao tribes became weaker and weaker, until they were finally extinct.” However, remnants of the ‘Three Miao’ nation still exist along the southern shores of the Yangtze River. Blunden (1983) shows them in three separate groups there. Mr. Kevin Pang may know well the location of that battle of San-miao, a place in the eclipse’s path, but Mo-tze’s text does not claim that those lights came out during the battle. The original recorders may have seen the strange lights in Yu’s capital (An-yi) and not in the battlefield. They may have seen the northern lights and not a solar eclipse. Legge (2000: 67) concludes that Yu’s expedition against the Meaou was unsuccessful. We may assume that the Three Miao tribes dominated the valley of the Yangtze, and the battle of Yu may have taken place to the north of the river. Several decades after Emperor Yu (Yü), a major solar eclipse was clearly recorded in the Bamboo Annals under Year 5 of Chung-k’ang, the grandson of Yu. On the first day of the third month of autumn, between 7 and 9 a.m. – as indicated by the character “chin” or “tchin” – the Sun and Moon did not meet harmoniously in the lunar mansion Fang (Scorpio). The texts claim that Hsi and Ho, the drunken astronomers, failed to warn the people in advance, and were executed. An emperor would not have executed two royal astronomers for their failure to predict a purely imaginary eclipse. As to the characters themselves, Medhurst translates them, “There was a conjunction of the sun and moon without being fully combined, in the constellation of Fang” (Legge, 2000: 166). The editors of Yung-ching’s Shoo give their opinion that Chung-kang succeeded his brother in Yang-hea, and that he was not in the possession of Yu’s capital called Gan-yih… They suppose that E (the prince of Yin) kept him off from all the country north of the [Huang] Ho (Legge, 2000: 163). Thus, if the Sun and Moon did not meet or combined harmoniously for the observers living to the south of the Yellow River, it may refer to a partial eclipse seen there. Gan-yih is Gan-y-hien in the early French works about China, as the point of observation. Another work (Chung Yoon-Ngan, 1998) claims that Gan-yi was located to the south of Luoyang in Henan. The name of a town named Kün (32-40 N, 111-21 E) in Andree’s Handatlas (1907) in that region sounds like the Turkish word for “Sun.” It may be just a coincidence: a librarian identified it on a modern Chinese map as Jun-xiàn on the Han River, to the NW of Lao-ho-kou. One may insert a speculation here about the recorded traditional (Keng-hsu, #47) cyclic day of the eclipse. It does not match the 2137 BC eclipse, but it does match a next eclipse that was expected to occur on a Keng-hsu day. It is the often suggested 13 October 2128 BC date for the eclipse of Hsi and Ho. My suspicion is that the astronomers became so concerned about their lives after the execution of the two court astronomers that they predicted a solar eclipse for the Keng-hsu day of October 13, 2128 BC. They were wrong because it was visible only in America. Our new theory may indicate that the ancient Chinese astronomers were not as silly as some modern experts suppose. Old (2004: 73) wrote in the year 1904, “Rather more than two-thirds of the sun’s disc eclipsed at Beijing” on October 11 O.S. (=October 1 N.S. ), 2154 BC. WinEclipse shows a magnitude of 0% at Beijing because the eclipse ended before sunrise. Some scholars of the West claimed a century ago that the 36 solar eclipse records – attributed to Confucius – did not come from original observations but rather recent falsifications by retro-calculation. The paper of Sukgeun Jung – that is not on the Internet anymore – cited the Handangogi, “Dangunsegi and Dangungosa record that, in B.C. 1733, five stars [planets] approached each other and became a cluster. The calculated year by the professor and his colleague was B.C. 1734, July 13.” While the starting point of the Korean calendar in 2333 BC might be helpful for Chinese scholars, a reader can be perplexed with these statements of modern Korean researcher. Indeed, a major planetary conjunction took place in July-August 1734 BC but the three descriptions above – cluster, alignment, or missing planets – are quite different. “We read that when the great Ha-u-si (The Great Yu), who drained off the waters which covered the interior of China, called to his court at To-san all the vassal kings, the Tan-gun [of Korea] sent his son, Pu-ru, as an envoy. This was supposed to be in 2187 B.C... ... On the island of Kang-wha, on the top of Mari San, is a stone platform or altar known as the Tan-gun’s Altar, ... Tan-gun resumed the spirit form, his grave is shown in Kang-dong and is 410 feet in circumference” (Hulbert, 1901, also 1999: 3). Perhaps Tan-gun’s grave may be dated by radiocarbon tests and may support the Korean traditions that place one of Emperor Yu’s regnal years to 2187 BC. Year 5, on October 22, 2137 BC, in Fang (Scorpio). The catastrophist author Velikovsky cited correctly from the ancient Chinese sources [translated by James Legge] that in the tenth year of the Emperor Kwei it happened that the planets went off their courses. In “The Chinese Classics” of Legge, Kwei (a.k.a. Chieh or Jie) was the eighteenth emperor after Yao. This astronomical event ended up in a few modern works as “the planets formed a cluster.” The author is of the opinion that such modified interpretation cannot be taken for granted. Rather, it is possible that none of the planets was visible in the night because they stood near the Sun. Thus, they could not have been visible as a cluster. Or, something rare astronomical event was observed when some planets were not at their usual places. (For example, on 30 April 1744 BC, at 4:18 a.m., the planets Venus and Saturn stood extremely close to the Moon that may have seemed rare and remarkable.) We have mentioned above the conjunction in the summer of 1734 BC. Major natural disasters began in the 10th year of the rule of Jie (=Kwei), when “five stars were seen in the sky in alignment and a meteor shower occurred” (Wikipedia). Pellegrino (1991: 237) wrote that “the sun was dimmed” in the 29th year of Jie. If this comes from a reliable source, it may correspond to the great solar eclipse of 16 May 1729 BC. Perhaps this darkening was caused by a “volcanic winter.” Pankenier (1984: 177) cites Mozi’s account from Mei (1976: 224), “When it came to King Jie of Xia, Heaven gave severe command; the sun and moon were untimely…” In the Bamboo Annals, “three suns appeared together” in king Kwei’s Year 29 (Legge, 2000: ). The planets allegedly went off their courses in Kwei’s tenth year that may be associated with the planetary positions on 8 April 1749 BC: Jupiter, Venus and Mercury formed a cluster near the Sun. Similar but less peculiar situations took place between February and April 1750 BC as well. Or, perhaps the chroniclers mixed up the two names, so the “tenth year” may belong to Tang, not to Kwei (Chieh). As for the planetary conjunctions, not all of them in the records can serve as good dating anchors. Legge (Volume V, 2000: 80) quotes the annals, “In summer, in the fourth month, on Sin-maou, at night, the regular stars were not visible.” This seems to refer to the planets, the regularly observed “stars.” It was recorded under Year 7 of Chwang, eleven years before the solar eclipse of 6 April 675 BC. However, no invisibility of the five planets took place on a day #28 – or any other day – in 686 BC. It may have been the invisibility of Saturn and Mercury in February 686 BC, or, that of Venus and Mercury in May 686 BC. It may not refer to a volcanic eruption either, for that would have dimmed the stars for more than one night. The myriads of books, papers and web sites only agree on a vague age, namely that the Shang Dynasty began in the grey area between 2000 and 1300 BC. Graves of eleven Shang monarchs have been found who were recorded as having reigned at Anyang (Roberts, 1999: 4). Why could not we get a few radiocarbon dates for some of those skeletons? From Legge’s chronological table we get 393 years (2158 less 1765 BC in the Common Scheme) or 394 year (1951 minus 1557 BC in the Bamboo Annals) for the interval between the accession dates of Chung-kang (four years before the eclipse of Hsi and Ho) and Kwei. 2141 BC less 393 would yield 1748 BC but the Common Scheme places Kwei’s accession to the throne in a Kwei-mao year (1818 BC). In reality, his rule of 31 full years may be placed to a cycle later, between 1758 and 1726 BC. It is well accepted that Tang became a Shang ruler in Kwei’s fifteenth year. Thus, it is reasonable to date Tang’s local accession in 1744 BC. The rule of Tang after the conquest could be placed in 1726-1713 BC. Wikipedia (“Jie of Xia”) states, “In Jie’s 15th regnal year, Shang Tang began moving Lü to the capital Bo” [Po] in Tang’s first year. The Bamboo Annals (Legge, 2000: [132-137]) give us the following data regarding the several capitals: Tang dwelt in Poh (Po) in his 18th year. Chung-ting, in his first year, removed from Po(h) to Gaou (Ho-yin in K’ae-fung). Ho-tan-kia, in his first year, removed from Gaou to Seang (in Ngan-yang, dept. Chang-tih, Honan). Tsu-yih, in his first year, removed from Seang to Kang and, in his Year 2, he removed to Pe or Pi (perhaps Ping-heang, Shun-tih, Chic-le). Nan-kang (Seuen), in his Year 15, built the city of Yin. Woo-yih, in his Year 3, removed from Yin to the north of the Ho and, in his Year 15, from the north of the Ho to Mei. Chang (1976: 81-82) gave a good royal genealogy of the Shang Dynasty and claimed, “The Shang Dynasty was established by Ta-yi...” [T’ien-yi, Tang]. He tabulated each of the 17 Shang generations in separate vertical columns, not horizontally. The gap between the minimalist and maximalist approaches is huge, and it is hard to take sides between those two extremes. Therefore, we may use a third way to proceed, at least regarding the length of the Shang Dynasty. It may reflect an independent tradition based on the intervals for the seven consecutive Shang capitals. The original dates and some numbers have been taken from Chang (1976: 49) but the dates have been modified by the author as follow. Notes: Chang (1980: 370) confirms “Po Hsien, the area of the earliest Shang dynastic locus.” “Hsien” probably means “capital” just as in the name Xi’an. The name of the modern town Xiaxian (35-08-19 N, 111-12-44 E) near Anyi (An-yi) may have meant, “Xia Xi’an” or the “Hsia Capital.” Similarly, the form “Gan-y-hien” in the works of some French astronomers in the 1700s about China must have meant ‘An-yi Xi’an or “Anyi Capital.” (The helpful librarians of the Guangzhou Public Library suggested me that the name “Gan-y-hien” with the story of the executed astronomers Hsi and Ho probably referred to An-yi.) The ending character in the name Huang-p’i-hsien maybe indicates the word for xi’an or hsi-an for the word “capital.” Two carbon-14 dates indicate that “the Bronze Age occupation probably flourished in Cheng-chou circa 1713-1433 B.C.” (Keightley, 1983: 525). Chang-chou was located in southern Honan. Zhou (1986: 113) notes that the quotation of the 273 years may be a commentary only that does not belong to the original text. Chang (1976: 49) wrote 262 years but the same author (Chang, 1980: 19) gives 273 years. Old (2004: 120) stated, “The Shang dynasty continued for 257 years after the removal of the seat of government to Yin.” Further, we may consider a few years of overlap in our chronology of the capitals at each moving, because at least a year was needed from the foundation of a new capital to erect the buildings for the court and the population while the old capital still functioned. After all, it seems unclear whether such recorded intervals did or did not exist in the original texts, or, these three numbers are only the results of modern speculations. The Bamboo Annals show 172 years between the accessions of Wu Ting and Ti Hsin (Chow Sin) while the Common Scheme gives 170 years for the same interval. Regarding the conquest of the Shang by the Chou (Zhou) Dynasty, the uncertainty remains in the modern sources. 1744-1726 Tang (Ch’eng T’ang) (15) Local ruler; conquered the Xia in his Year 18. 1726-1713 Tang as emperor 13 (C.S.) Ruler over both the Shang and Xia territories. N/A T’ai Ting A son of T’ang, crown prince. He died young. Ting’s accession year suggested by Tung Tso-pin. years before that of Ti Hsin (a.k.a. Chow). his 35th year. See Nivison (1999). Wang) to death [in 1182 BC]. ki-nien or Bamboo Annals (Biot, 1841: 576-577). A continuous and unbroken sexagesimal cycle exists in China since times immemorial, to mark each individual day. Legge (2000: ) shows them in English and Chinese, with their pairs of Chinese characters. In our opinion, such minor variations would not influence the identification of the lunar eclipses. These five identified lunar eclipses and the following six solar eclipses - altogether eleven well-defined eclipses - fix the chronology beyond reasonable doubt. Thus, the chronology cannot be called "floating" anymore. The 'three flames' eclipse record may refer to the plume-like structure of the solar corona. Note: (m) stands for lunar eclipses in the morning, between midnight and sunrise; (e) means an eclipse in the evening, before midnight; (e-m) is an eclipse starting before midnight and ending after midnight. The Julian Dates refer to the date and cyclic day indicated by the bold numbers. Each of the five records offer two possible matches as shown. It is interesting to see that each of the ten candidates matches with the day after the night of the eclipse, and not the day before. Therefore, it seems, every evening – after sunset – actually belonged to the next Chinese day (of the sexagenary cycle), just like in the Jewish calendar. The group of the matching five lunar eclipses can be placed between 1351 and 1307 BC while the rule of Wu Ting between 1339 and 1280 BC. Chang (1980: 324-8) examined alternative possibilities for the five lunar eclipses. Sir Leonard Woolley (1963) wrote, “From China we have, in one Anyang bone inscription, a very early record of an eclipse which took place ‘on the fifteenth day of the twelfth moon of the twenty-ninth year of King Wu-ting,’ i.e. on November 23, 1311 B.C. (2)* which shows an interest, and possibly a knowledge, antedating anything of the sort in Egypt. The inscription by itself is insufficient to prove that the interest went beyond the recording of a striking phenomenon, and the fact that the record figures in an oracle-text may well raise doubts as to its scientific value. “But in the Chou records we are told that in the thirty-eighth year of the reign of the Shang ‘emperor’ Ti-hsin (1137 B.C.) the Chou ruler Chou-wen-wang ordered a sacrifice to be offered because ‘the eclipse happened not on the right day’: it occurred on the sixteenth day of the month, according to the calendar, instead of the fifteenth. Woolley was an outstanding scholar, so the eclipse record from the 29th year of Wu-ting cannot be his bluff. (I was unable to identify the text by a “catalogue number” in any museum.) This data indicates that here we have two similar lunar records in Wu Wang’s days: one of them refers to a lunar eclipse in the twelfth month while the second one in the thirteenth month. “Woolley’s eclipse” took place on a day#58 (24 November 1311 BC, JD 1242908), and the other eclipse either on a day #56 or #57, with two candidates (1315 or 1284 BC) as shown above. Regarding the above mentioned “untimely” lunar eclipse in Year 38 of Ti-hsin, it must have been observed on 6 November 1133 BC (JD 1307905/6) that fell on the sixteenth day after new moon, or, on the 17th day by the usual inclusive reckoning. (The previous new moon fell on October 21.) Its maximum magnitude was 74.83%. This eclipse would yield 1170 BC for the tyrant’s accession. Further two astronomical records – a planetary conjunction and a probable solar eclipse – yield us the same year, 1170 BC, for the accession of Ti-hsin to the throne. For the lunar eclipse in Year 35 of Wen Wang please refer to the Chou Dynasty. 1176 BC (August 19, JD 1292120) Solar eclipse on a day #10, 95.26 17:26:22 25618.3 in the evening. A preliminary identification attempt a few decades ago did not find matches for the eclipse days #2, #38, and #45. Thus, it was considered that the original records had contained minor mistakes regarding the eclipses of 1172 and 1161 BC. Other experts followed such approach. Kelley (2005: 321) claimed, “ssu wrongly appears as chi in the K.C. Chang list” twice. However, such theory of errors does not have justification anymore because the correct matches do exist. The two “-ssu” day-names in K.C. Chang’s list, cited from professor Chang (Zhang) P’ei-yü, are correct and there is no need to change them. Littmann et al (1999: 228) refer to “1217 B.C. : Oldest Chinese record of a verifiable solar eclipse – inscriptions on an oracle bone by the Shang people.” However, one cannot find any solar eclipse visible from China in that year. the record as a total eclipse at Anyang on June 5, 1302 BC. Pfeiffer (2002: 26) adds that after a day Yi-mao (52nd of the cycle), the dawn was foggy and ‘three flames ate the sun.’ I checked the Online Julian Date Converter and found that Pang’s date corresponds to JD 1246023, indeed, that is correct for a day #53. The identification resulted in some fierce opposition for Dr. Pang. Sympathizing with both camps, my further research yielded a better candidate on a similar cyclic (sexagenary) day. It was the total solar eclipse of 4 March 1250 BC (JD 1264923, a day #53). The path of totality was much closer to Anyang then in 1302 BC. A remark is that an oracle bone found in the capital, describing a total eclipse, is not an absolute proof for totality there. It may have been a report sent by an astronomer living at the border of the empire. In our case, the magnitude of this ‘three flames’ eclipse on March 4, 1250 BC was 99.99% in the modern city of Huai’an. (It is located at 33° 33' north and 119° 02' east, circa 500 kilometres to the south-east from Anyang. According to the map of Goodrich (1972: 11), the mouth of the Yangtze Kiang was on the border of “Shang Dominion.” The maximum magnitude of the eclipse was 88.56% in Anyang (Xiao-t’un). During the eclipse of 4 March 1250 BC, the Venus was visible with a magnitude of -4.8 (illuminated fraction 27.0%); the Saturn (m=0.7, ill. fr. =99.8%), the Jupiter (m=-2.0, ill. fr. =99.4%), the stars Capella (m=0.1) and Vega (m=0.0) may have been visible. In comparison, during the eclipse of 5 June 1302 BC, the sky was less dark in An-yang, also the planet Venus (magnitude=-3.9, illuminated fraction=86.3%) stood near the eclipsed Sun. Assuming that the first lunar eclipse above (1351 BC) roughly coincided with Year 1 of P’an Keng and the last solar eclipse (1176 BC) with the last year of Wen-wu-ting, our data yields an interval of 175 years for six generations. (Period 1 of Tung Tso-pin’s grouping included Wu-ting and his three predecessors. Period 4 included two generations: Wu Yi and Wen Wu Ting.) This means an acceptable average of 29.1 years per generation. For a clear understanding of the six solar eclipses in question please refer to the WinEclipse maps below. Regarding the planetary conjunction in Year 32 of the tyrant Ti-sin (Ti Hsin), we may note that on 25 October 1138 BC the planets Venus and Jupiter stood near the azimuth of Antares (21 α Scorpii), near the Sun. For comparison, about the end of May 1059 BC, all planets stood near the Sun, and were similarly invisible. However, this conjunction did not occur near Scorpion that the record requires. Wen Wang was a significant local ruler of the Chou (Zhou) Dynasty, from 1171 to 1130 BC, in the author’s opinion. In c. February 1135 BC, he appointed Wu Wang as his heir, in Year 36 of Emperor Ti Hsin (a.k.a. Chow), see the Bamboo Annals. Wen Wang died in the second month of spring, in Ti Hsin’s 41st year (Legge, 2000: ). An oracle bone inscription testifies that in Year 35 of Wen Wang, in the first month, a lunar eclipse took place on a day Bingzi (Ping-tzu, #13 of cycle). According to Pellegrino (1991: 237), Kevin Pang identified the lunar eclipse of January 29, 1137 BC that occurred in the 35th year of King Wen. The date has been verified by astronomer David Darling (2003) as the evening of 29 January 1137 BC. [We shall add that the eclipse ended at about 23:13 in local time. The day January 30 was Bingzi but the eve of an ancient Chinese day belonged to the next day that was JD 1306163 in this case. This lunar eclipse also proves that the Chinese days began at sunset.] This Bingzi eclipse is mentioned by Keenan (2002: 64-67) Nivison (1999) and Pankenier (2007: 140) as well but dated to 13 March 1065 BC. Marshall (2001: 51) suspects that Hexagram 55 of the Zhouji may refer to the total solar eclipse of 20 June 1070 BC when the Big Dipper was seen. The present author found the 10 September 1121 and 23 December 1117 BC eclipses although they did not occur at noon. During the acceptable eclipse of 23 December 1117 BC, at 14:26:19 p.m., the Big Dipper may have been visible at a magnitude of 85.20%. (Shetline’s SkyViewCafé gives 15:27 for that local time.) The ancient records tell that the “day grew dark” just before the battle of Muh. See Legge (2000: 301). It is tempting to identify it with the solar eclipse of 23 December 1117 but the cyclic days do not match. Wu Wang (Woo, a.k.a. Fa) became an effective local ruler of the Chou (Zhou) in late 1129 or early 1128 BC. In his Year 11 he crossed the Ho but withdrew his army on a day Ping-woo. In his Year 13, he crossed the Ho at the Mang or Mengjin ford (ferry), attacked and defeated the Shang Dynasty in the battle of Mu(h) or Muye. Then he executed its last emperor on 27 January 1116 BC. Tradition claims that he defeated the Shang Dynasty when the year-star Jupiter was at the Cancer-Leo station. See Chang (1980: 16). According to astronomy professor A. Ponori Thewrewk, the planet Jupiter stood there about July 15, 1118 BC, at c. 95° of the ecliptic. The borderlines between the Chinese constellations do not coincide exactly with those of the constellations in the zodiac of the Western cultures. Other Chinese traditions claim that a ‘broom star’ (comet) flashed on the sky during the battles between the Shang and Zhou dynasties (Chang: 1980: 18 and TIME magazine, May 23, 1994: 48). Legge (1998: 280-1) quotes Mencius, “Châu-kung assisted king Wû, and destroyed Châu. He smote Yen, and after three years put its sovereign to death.” This opinion is not supported by other sources that allow maximum three months between the conquest and the execution of Chow (Châu, Ti Hsin). These mean that we need a new moon in the first or second month on a day #27 when the end of the Moon’s waning coincided with a day #29, then a new moon on a day #56 in the third month, a new moon on a day #26 in the fourth month, and a full moon on (or around) a day #42 two weeks later. Such situation has the best fit in 1117-1116 BC as follows: the day #56 in the third month was 22 January 22, 1116 BC (JD 1313826), and the cyclic day #26 in the fourth month was 21 February 1116 (JD 1313856) that actually began on the evening of the previous day. It is irrelevant whether there was a numberless extra intercalary month before the third month, or was not. That is unconceivable for me because the intercalary month would always be the 13th month. Rather, the narrative refers to the “first month of the events” (the conquest) and not the first month of the year. In any case, that month in question must have begun at new moon on the eve of the day #27, on 23 December 1117 BC. Thus, the day Jen-ch’en (#29) was “near” (“pang” or “bang”), indeed, corresponding to the “p’ang ssu pa” position. Therefore, Ti Hsin (Di Xin), the last Shang ruler, was executed on 27 January 1116 BC. Wu (Woo) Wang as a king (January 1116 – end of 1110 BC) ruled over the Chou and Shang dominions for six years, according to the Bamboo Annals. He died at the age of 54 (Biot, 1842: 382) or, at the age of 94, in his Year 17 (Legge, 2000: ). The latter may mean 1111 BC. The 37 regnal years of Ching (January 1110-1074 BC), the son of Wu Wang, include the seven-year guardianship of Tan, the Duke of Chow. However, some sources appear to record his real accession after the lapse of those seven years, in 1104 BC. Ancient historians dated the foundation of Lo(h) in the seventh or fifth regnal year of Ching. Six days after the full moon (that fell on 18 January 1098 BC) of the second month, on a day Yih-we (#32), the king went to Fung. In the third month, the appearance of new moon took place on a day Ping-woo (#43 of the cycle), see Legge (2000: 420-421). Indeed, one can identify this day as 5 February 1098 BC (JD 1320414). The new moon fell on February 2, at 15:36 in Xi’an. (The crescent could become first visible 25 hours later, under optimal atmospheric conditions.) Therefore, the sickle of the new moon appeared on February 4, 1098 BC. The author, after long calculations, rediscovered the results of Gaubil who identified the same event on a day Ping-woo in 1098 BC. Legge adds that the Bamboo Annals placed Lo’s foundation in 1038 BC. My understanding is that the correct astronomical date seems to be 1098 BC, exactly one cycle away. The Bamboo Annals placed the first year of Ching in a cyclic year #34, and Lo’s foundation in his Year 5 (year #38). The former corresponds to 1104 BC but the latter correctly to 1098 BC, so it must have been in Year 7 of Ching. Ch’ing K’ang-shing proposed the fifth regnal year. See Legge (2000: 420-421). Ching died in 1074 BC when a day Kea-tzu (#1 of cycle, a sample day is JD 1764851) fell about full moon in the fourth month, in the summer. Others claim that he died on a day #47. Narrien (1833: 344) cited the astronomer La Place regarding the observations made under the regent Tcheou-Kong, who is said to have lived between 1104 and 1098 B.C. Those observations made by gnomon at Luoyang, and supposing that the observations were made in 1100 B.C., La Place found a difference or error of 2 minutes 04 seconds only which is inconsiderable. In his 14th year, in the summer, the ‘regular stars’ or planets were invisible. Such planetary conjunction took place around May 15-20, 1035 BC. In the 19th year of Ch’aou, in the spring, a ‘bad omen star’ [a comet] appeared in the tse-mei or tse-weï [l’enciente bleue in the text of Biot (1842: 389), the group of stars about the celestial north pole], and the heavens were so dark that pheasants and hares were terrified. See Legge 2000: . Since those animals do not live in cities, this darkness may have been seen during a royal hunting expedition, probably in the Ordos area. It was the solar eclipse of 29 April 1030 BC, with a magnitude of 90.06% at the location 39°45' N, 110°02' E; the Sun’s altitude was 34.8° at the maximum phase. Note: The animal response during solar eclipses over a magnitude of 70% is known from many countries. For comparison, Dio Cassius recorded, “Also the elephants which drew the chariot of Augustus, when they had entered the Circus and proceeded as far as the senators’ seats, stopped at that point and refused to go any farther” during the solar eclipse of 30 April 59 CE. That eclipse had a magnitude of 77.24% in Rome. A few years ago an astronomer observed in Baja California that, long before totality, a few minutes after the darkening of two-thirds of the Sun’s disk, the birds began to make a noise of excitement. Professor Ciyuan Liu also considered that this, when the “sky darkened heavily” (or Tian-da-yi) in the records, was caused by a solar eclipse. Professor Ponori Thewrewk suggested me the date May 15-20, 1035 BC for the associated “invisibility” of the planets although Jupiter and Venus may have been visible faintly for a short time. As for the spring of 1030 BC, this is the earliest accurate record in world history that is giving the position of a comet. 940-928 Kung 12 (C.S.) He was also known as Gong-wang or Y. In his first year the Sun rose twice in Zheng (Yinzheng to the SE of Louyang). The interpretations of this “double dawn” record have led to a very considerable flow of ink. The text does not claim that the second “dawn” took place in the morning. Simply, after an eclipse, the Sun can rise for a second time during the day. We may identify it with the solar eclipse of 21 March 926 BC, near the end of E’s first regnal year. Stephenson (1997: 220) expresses doubt that the event [of the double dawn] refers to an eclipse at all, because the term shih is not used in the description... (Kelley, 2005: 122). 902-893 Hiao 9 (B.A.) He was also known as Hëaou or Pie-Fang. 893-877 E 16 (C.S) He was also known as Yi-wang, Y, or Sie. 877-826 Le 51 (C.S.) Hew also known as Li-wang, Hou or Hoo. 826-781 Hsuan (Seuen) 46 both He was also known as Xuan-wang or Tsing. In his Year 6 in winter, 10th month, on a day Sin-mao (#28 of the cycle) a solar eclipse was observed. It was a minor eclipse in northern China, with a lunar eclipse a fortnight away. This pair of eclipses is mentioned in the Bamboo Annals and the Book of Odes. The lunar eclipse took place on 21 August 776 BC, and the solar eclipse on 6 September 776 BC. Legge (2000: 57]). Notes about the sixth year of Yew: The Shih King, Ode 9 recorded, “At the conjunction (of the sun and moon) in the tenth month, On the first day of the moon, which was hsin-mâo, The sun was eclipsed, A thing of very evil omen. Before the moon became small, And now the sun became small. Henceforth, the lower people Will be in a very deplorable case. The sun and moon announce evil... For the moon to be eclipsed Is but an ordinary matter. Now that the sun has been eclipsed, - How bad it is!” See Müller (1879: 296 and 355). This sound like a sarcastic exaggeration how bad the solar eclipse has been, just if an American today would say about an insignificant issue, “Big deal!” The text is a literary one, not an astronomer’s record of a major eclipse. Perhaps the astronomers predicted it that caused fear, and they claimed that their prediction had been correct. “The year B.C. 775 [correctly -775] is the earliest date which can be said to be determined with certainty… is very important, as being the earliest which astronomical calculation really confirms,” wrote Legge (2000:  and ). Narrien (1833: 347) referred to this eclipse as an identified event. Souciet’s Volume I (1729: 30) and the 1970 reprint of Gaubil (originally 1759) also mention this solar eclipse of 776 BC. Indeed, this minor eclipse in the tenth month, in Year 6 of yew, fell on day Hsin-mao (cyclic day #28, JD 1438238), on 6 September 776 BC. In Ji, the northernmost town of the Zhou Dynasty in Blunden (1983), the magnitude was 1.79% only. Supposing a location 40-00 N and 117-30 E, at the Great Wall in Yen province at the Liao River, the magnitude was 1.83%, while a north-western point [41-20 N, 107-00 E] would yield 5.34% that was quite visible. The lunar eclipse two weeks before the solar one was real, on 21 August 776 BC. Such recorded minor eclipse is comparable with the second eclipse of Herodotus. It occurred when Cleombrotus called back his troops from Corinth to Sparta. It had a magnitude of 5.40%in Sparta, and only 3.67% in Corinth. (The altitude of the Sun was much higher than at the Chinese eclipse above.) Hind, see Chambers (1889: 322-323), unsuccessfully called the attention of scholars to the error of two years in ancient Greek chronology. He dated the eclipse of Xerxes in Sardis to 778 BC, instead of the mainstream 780 BC. In our opinion, the culprit may be the three versions (Lysistratos, Lysanias and Lysitheos) of the same name in the list of Athenian archons (Bickerman, 1980: 138). Opaque or semi-translucent slices of stones, including jade, may have been used to view solar eclipses in various ancient cultures since times immemorial. Stephenson (1997: 54) refers to Naturales Quaestiones I, 11. of Seneca (first century CE), “Whenever we want to watch an eclipse of the Sun we set out basins filled with oil or pitch, because the heavy liquid is not easily disturbed and so preserves the images it receives.” It is hard to support a modern claim that most eclipses under the magnitude of 99% went unnoticed and could not have been recorded. There are nine eclipse records claiming that the stars became visible in eclipses between magnitudes of 77.23% and 95%. They are as follow. Constantinople: October 990 (77.235) and August 891 CE (89.33%); Medina: December 671 CE (80.85%); State of Chin, south: October 444 BC (80.30%); Bari: July 939 CE (94.87%); Campania, Italy: April 59 BC (81.84%) and July 306 CE (87.21%); Xi’an: July 382 BC (82.70%); and Jiankang (China): December 429 CE (93.74%). Marilyn Shea (2007), under the sunspots, shows a photograph of a carving depicting a total solar eclipse. It was unearthed in Nanyang, Henan Province (33°00' N, 112°32' E). The Sun is symbolized as a golden bird and its center is covered by a toad, the symbol of the Moon, with two stars to the right. In the Han Dynasty, people had a saying… (rì yuè hébì). It means that the Sun and the Moon have made a harmonious combination.” (If a total eclipse was called “harmonious” in China, we may suspect that the 2137 BC eclipse was not total because the Sun and Moon “did not meet harmoniously in Fang.”) Returning to the carving, it is not too helpful for dating because there were three total eclipses of the Sun in Nanyang during the Han Dynasty (206 BC to 220 CE). About two years ago the author visited his wife in China again. (Due to Canada’s red tape – that ignores the legislation – she cannot get any visa to that country, since our wedding in 2006.) Once on board, approaching Hong Kong from the region of Taiwan, slightly to the south of the airplane, several strange lines became visible on the sea floor. They were located in the shape like a letter four on the small screen of a pocket calculator. The wide lines were apparently flooded ditches or channels, very long and straight. Perhaps three or four of the straight lines under the sea formed right angles. They appeared to be a network of human activities, either channels or dykes, or their shadows. The sea must have been shallow there. It could not have been an optical illusion because they were visible for about fifteen minutes from the airplane’s window. They could not have been, for example, shadows of the condensed gas lines left by jets because no one has ever reported such shadows. Also, airplanes would not criss-cross each other’s path so closely. This is just a reminder for the world that, in prehistoric times, civilized man may have lived and worked in areas now under the sea. Of course, it is hard to connect such possible activity with emperors Yao, Shun, or Yu, because those lands were flooded at least 10,000 years ago. Nevertheless, Chinese archaeologists may become interested by reading this paragraph. Would the "Yonaguni Monument" (与那国島海底地形, Yonaguni-jima Kaitei Chikei, lit. "Yonaguni Island Submarine Topography") have had some ancient connection with our sunken ditches or dykes? It is a massive underwater rock formation off the coast of Yonaguni, the southernmost of the Ryukyu Islands, in Japan. The reader can find several good web sites about Yonaguni by Google search. Amongst many prominent astronomers, professors Meeus (c. 2001), Morrison and Stephenson (1982 and 2004), also Ed Jones, Prof. Dr. Peter J. Huber and British astronomer Sheridan Williams dealt extensively with the questions and suggested values of the Delta-T. The present author takes advantage of this unique opportunity to humbly communicate some new information about the Delta-T in ancient times. It comes from the city of Nineveh in Mesopotamia. The record is in the book of Professor Hunger (1999: 118) who quotes Professor Simo Parpola (1993: 113-114, Letter 149), about a lunar eclipse on the fourteenth day of the month Simanu, during the morning watch... in Scorpio... The Shoulder of Panther was culminating. The magnitude of the eclipse was two fingers [wide] took place. Also see Parpola (1970: 71), about the lunar eclipse in the month Simanu, during the morning watch, in the constellation Scorpio: the kumaru of the constellation Panther was culminating [when] the eclipse of two fingers took place. Hunger (1999: 84 and 275) refers to the scholarly consensus that the Shoulder of the Panther was γ (Gamma) Cygni. Other authors describe this eclipse of two digits (see Letter 1444 in Waterman, 1930-36: 505) but incorrectly identify the star “Kumaru” on the meridian as the eta Cygni in Ophioucus-Serpens. The present author managed to identify the eclipse with the Gamma Cygni culminating during the “2 fingers” maximum phase of a lunar eclipse, in the morning watch. Namely, it must have occurred on June 11, 669 BC (-668). While – with the author’s recommended Delta-T values – the maximum phase of two digits occurred at 2:10 on 11 June 669 BC, the culmination of the star Gamma Cygni (and the IC 1318 Nebula) took place between 2:05 and 2:03 in the morning, in local time of Nineveh (36-22 N, 43-09 E). The difference is 4.5 minutes which could be qualified as an excellent match. Please refer to our figure below, computed by the www.skyviewcafe.com software. One may observe that the Delta-T (Δ-T, DT) values given by Ed Jones seem the best and most useful. They are incorporated into the WinEclipse program of H. Scsibrany (2005). However, the present author suggests that his values given in the latter should be multiplied by a factor of 0.98115 everywhere, at least in ancient times (BCE). Our table below shows the calculations of 91 observed ancient eclipses, with such improved values of Delta-T, that had been recorded in three continents between 2353 BCE and 1514 CE. Many of the eclipses listed are cited from the works of R. R. Newton (1970 and 1972) and Stephenson (1997). Pfeiffer (2002: 18-24) deals with the DT issues as well. The book of Balázs et al (1980: 114-9) has a chapter about the subject “measuring of time based on [coral] growth lines.” It includes an enlarged cross section of a petrified coral, with a graph. The latter shows that 280 million years ago the year had 390 days; 405 million years ago 402 days, and 600 million years ago 424 days. A perfect curve of Delta-T that reflects the slowing rotation of our planet, projected back to ancient geological times, shall go through those three points. A final note calls the attention to a less known source (Krasznai, 1998) that gives a list of excellent correlations between planetary conjunctions and earthquakes. The possible future translation of his book may allow scientists to predict earthquakes with a higher probability. 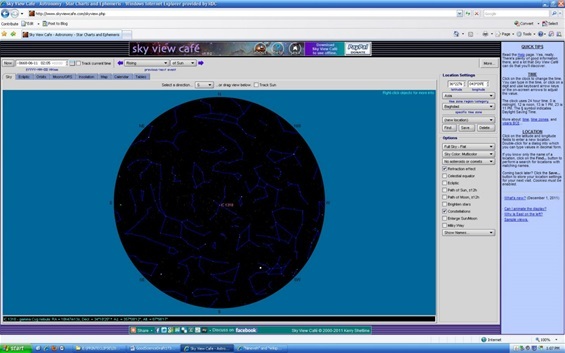 Further, two free astronomy programs are available on the Internet – see our Bibliography under Shetline and Scsibrany – that could facilitate the education of this science in our universities, making the study of astronomy a sort of fun. The author’s sincere appreciation and thanks go to the following persons, mainly astronomy experts and professors: (Aurél Ponori Thewrewk (Hungary), Sheridan Williams (United Kingdom), Peter J. Huber (Switzerland), Chang P’ei-yü (Nanking, China), Jean Meeus (Belgium), Ed Shaughnessy, Kerry Shetline (USA), P. Eng. Gerry Huang (Vancouver, Canada), Mr. Ed Jones, and my wife ZuanHao Zhong (Guangzhou, China), also to the librarians of the Sun Yat-sen Library of Guangdong Province and those of the Red Deer College Library (Canada). Without their unselfish support, assistance and helpfulness this paper simply would not exist. Chang, Kwang-chih. Shang Civilization. New Haven and London: Yale University Press, 1980. Ho, Peng Yoke. Li, Qi and Shu: An Introduction to Science and Civilization in China. Minneola: Dover Publications, Inc., 2000. Hunger, Hermann, and David Edwin Pingree. Astral Sciences in Mesopotamia Part 1, Volume 44. Leiden: Brill, 1999. Krasznai, István. Bolygóvilágunk Titkai. [Secrets of our Planetary World, in Hungarian]. Üllö: Metropolis Press KFT Kiadó, 1998. Lee, Cyrus, trans. The Complete Works of Motzu in English. Beijing: Commercial Press, 2009. Legge, James. The Chinese Classics. Vol. III. Taipei: SMC Publishing Group, Inc., 2000. Reprinted from the last editions of the Oxford University Press. ___. The Chinese Classics. Vol. III. Hong Kong: Hong Kong University Press, 1960. (It is identical to the SMC edition.) Also, the London: Trübner & Co., 1865 edition as a Google eBook: http://books.google.ca/books?id=cjtNAAAAcAAJ. Morrison, L. V., and Francis R. Stephenson. “Secular and Decade Fluctuations in the Earth’s Rotation: 700 BC – AD 1978.” Sun and Planetary System. Eds. W. Fricke and G. Teleki. Dordrecht: D. Reidel Publishing Company, 1982. ___. “Historical Values of the Earth’s Clock Error ∆T and the Calculation of Eclipses.” Journal for the History of Astronomy 35. (2004): 327-336. Nu, He, and Wu Jiabi. Chinese Archaeology – Astronomical date of the “observatory” at Taosi site. www.kaogu.cn/en/detail.asp?ProductID=1296. Beijing: Institute of Archaeology, CASS, 2005. Parpola, Simo. Letters from Assyrian and Babylonian scholars – State Archives of Assyria, Volume X. Helsinki: University Press, 1993. ___. Letters from Assyrian Scholars to the Kings Esarhaddon and Ashurbanipal, Part I. Neukirchen-Vluyn: Neukirchner Verlag, also Verlag Butzon & Bercker Kevelaer, 1970 and 1983. Pfeiffer, Bernd. “Sand im Getriebe der Zeit – Säkulare Akzeleration des Mondes: Mitglied im Arbeitskreis Astronomiegeschichte in der Astronomischen Gesellschaft.” Mainz, 2002. Web. Playfair, James. A System of Chronology. Edinburgh: William Creech, 1784.
de Saussure, L., Les Origines de l’Astronomie Chinoise. Paris: Maissoneuve, 1930. A. Pogo reviewed this book in Isis 17 (1932): 267-271. Shea, Marilyn. Sunspots, Eclipses, Meteorites – Chinese Astronomy. 2007. Simon, Zoltan Andrew. Absolute Dates for Ancient China by Astronomy. Berlin: Rhombos Verlag, 2007. Tan, Qi Xiang, editor. Zhong guo lì shì dìi tu ji [in Chinese, meaning Chinese History Maps in seven volumes [in Chinese], Volume II. Shanghai: Cartographic Publishing House, 1980. Waterman, Leroy. Royal Correspondence of the Assyrian Empire, Volumes 1 and 2. Ann Arbor: University of Michigan Press, 1930-36. Whitfield, Susan, et al. IDP – The Chinese Sky. http://idp.bl.uk/education/astronomy/sky.html Last revised in 2011. Figure 1. In Laiyang (Central Shandong) the star Alphard (30 Alp Hya) culminated one minute after midnight on 9 January 2347 BC. Figure 2. In Shanghai, in southern China, the star 6 Pi Scorpii culminated one minute after midnight on 11 April 2347 BC. Figure 3. In the Taosi observatory the star 22 Beta Aquarii culminated at midnight between 13 and 14 July in 2347 BC. Fig. 4. In Chengde (northeast of Beijing), the Alcyone (Pleiades) culminated one minute after midnight on 12 Oct 2347 BC. Figure 6: The culmination of the star Gamma Cygni and IC 1318 Nebula during the 2-digit maximum phase of the lunar eclipse seen at Nineveh, on 11 June 669 BC, at 2:05 local time – evidence for the correctness of the Delta-T used by Kerry Shetline (SkyViewCafé). 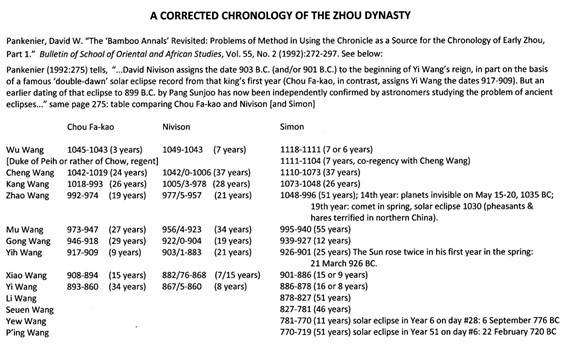 This table shows A CORRECTED CHRONOLOGY OF THE ZHOU DYNASTY. It compares the dates suggested by three authors: Chou Fa-kao, David Nivison, and Zoltan A. Simon.